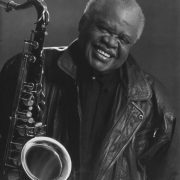 Tenor saxophonist Stanley Turrentine, also known as “Mr. T” or “The Sugar Man” (April 5, 1934 — September 12, 2000) had a distinctive sound. In just a few notes, that thick, rippling tone, with an earthy grounding in the blues, quickly became apparent. I interviewed Mr. T several times, and found him to be as warm and gregarious as his music. From a 1997 concert at Pittsburgh’s Manchester Craftsman’s Guild, Mr. Turrentine works out on “Cherokee” with Billy Taylor on piano, Rufus Reid on bass and Roger Humphries on drums.